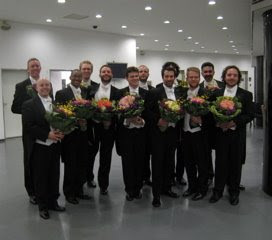 We received beautiful bouquets - roses and orchids -during the huge applause at the end of our concert in the Shenzen Concert Hall. A great hall - and what an acoustic ! really superb- as it turns out by Yasuhisa Toyota, the acoustician who did LA's Disney Hall. The audience was one of the most quietly energetic and attentive anywhere ever. Not a peep out of them, just a very studious focus all along, and an eruption of appreciation at the end. 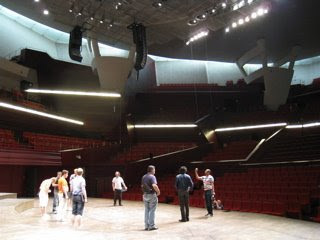 We always go straight into the hall and onto the stage, so often we don't see the rest of the hall until the end of the concert. 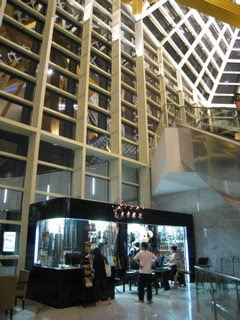 In Beijing we never saw the public entrance to the national theater - it was too far, and the security too intense. The titles announce our concert, and continued announcing the numbers as we went along. 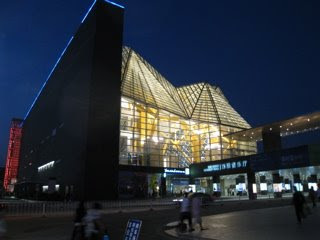 The Shenzen Concert Hall, designed by Arata Isosaki and opened in 2007 ( same year as the Suzhou Grand Theater) - attached by a bridge to the Shenzen Library. 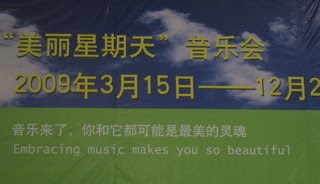 It seems that every important city in China has a new performing arts facility. 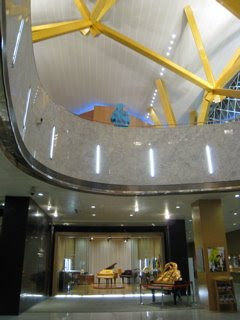 An interesting feature of this hall to us were the two musical instrument stores in the lobby. The Baldwin piano store was heavily frequented before the show, and kids were having their pictures taken with the pianos. As always there were a lot of small children at the concert who seem to be completely focussed. The rule is that you have to be at least 1.2 metres or at least 6 years old to be allowed in although clearly that rule is not inflexibly enforced. 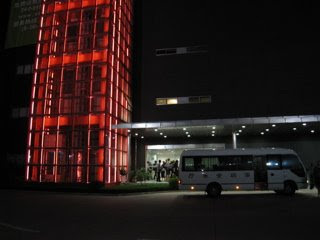 Exiting into the sultry Shenzen night (there's a tropical feel here, very different from the dryness of Beijing) for our post concert dinner. The red lights are on the elevator shaft. 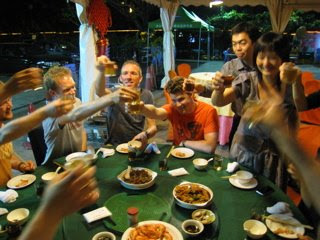 We had a fantastic Cantonese meal offered us by Xu Xiao, Artistic Director of the Concert Hall (on the right). It was especially agreeable to be eating outdoors. We hope we get to come back to this hall. Meanwhile we're off to Hong Kong, and we leave you with this thought from a poster in the lobby.